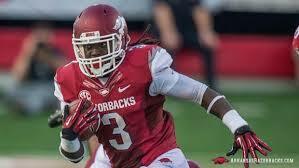 RB-Alex Collins, Arkansas 5′ 10″ 217 lbs. Cons: Simply stated the back did not have a good performance at the NFL Combine. He ran a 4.59 40-yard dash (the bottom three for half backs that ran) and had a dead last vertical jump of 28.5″. Size and explosion are not everything, but combined with his lack of leg drive/power, Collins simply isn’t a NFL three down back at this point. The runner needs his offensive linemen to create space for him to maneuver around; this is especially true with goal line work. He is not very proficient catching the ball (averaging nine receptions per year). The former Razorback is an average, at best pass blocker which might tip-off NFL defenders to what the offense will do when the back is on the field. Pros: Collins has good vision and balance along with great lateral agility that makes him quicker than fast. He starts and stops his feet with ease, shows good lean, and falls forward keeping his legs churning to gain additional yards. The back has more of a one-cut and go slasher style that he combines with spins, shoulder shakes, jump cuts, and stiff-arms to create space. Collins is great on counters and finding the cutback lane as these feature his loose hips while making the first man miss. The runner prefers to run outside which could be dangerous in the NFL, but seems to find an extra gear once he breaks into the open. The former Razorback has kickoff return experience, which might give him a chance to get on the field a bit earlier than expected. Overall thoughts: Although Collins had a challenging Combine performance, he is still a 2016 top six running back option for your dynasty team. If he lands on a zone-blocking team, the back could be a very productive fantasy asset. However, if Collins goes to a power based running game, it might take him some time to be productive. I agree with the Chris Ivory comparison and remind potential fantasy owners that it took Ivory a team switch to get to his full potential. « Keith Marshall: Combine wonder or more?